Florida Landscape Art...Oil Paintings inspired by plein air studies painted with bold brushwork and dynamic color. "Great Blue Heron" is 2" x 4", painted in oil on gallery wrapped canvas. These large birds are found throughout Florida. They are solitary birds, preferring to be alone to feed in most any standing water. This is gong to be a very busy few weeks for me. As usual, I cannot say no when I am invited to participate in highly respected plein air events. But I might have overdone it this time. Saturday, April 17 is the first day of the Evinston Plein Air Event. I am happy it is just up the road a bit from me so I can return home each night. I enjoy painting in Evinston, Cross Creek, McIntosh, River Styx and all the little out-of-the-way places one finds in this part of north Florida. In addition to painting all day there are two public receptions scheduled: Wednesday, April 21 at Padiwack Gallery in the Thornebrook Mall in Gainesville, free to the public and Saturday, April 24 at at the Gala Reception at the UF President's Home in Gainesville, $35.00 per person. A portion of the funds raised by art sales will go to restoring the historic Wood and Swink Post Office and Country Store in Evinston as well as to the Florida Land Trust. Go to www.evinstonpaintout.org and www.conserveflorida.org for more information. Thursday morning I will be on my way to Ft. Pierce for their "Souvenirs of Downtown" Plein Air Event. I have to hit the ground running when I get there, painting all day and then attend a public reception/sale that night; paint again all day Friday and another reception/sale that night. Saturday morning I head back to Ocala to get ready for the Evinston Gala. A portion of the proceeds from art sales will go to restoring the Backus House and revitalization of downtown Ft. Pierce. Although the Winter Park Polasek Museum Plein Air Event begins on Sunday, April 25, I hope to take a day or two to reorganize and repack. When I catch my breath I will be off again for another week of painting. A portion of the art sale proceeds from this event go towards the Polasek Museum. The day I return home from Winter Park my house guest arrives. Elin Pendleton, artist extraordinaire from California is staying with me for the week. She is giving a workshop at my gallery here in Ocala. THEN, when all is over and everyone has gone home...I can sit back and put my feet up. No more events or shows until next September!!! The Gainesville Spring Arts Festival was great!!. Lots of people strolling the oak lined streets. Many long time friends dropped by. Met new folks who appreciate art and the Florida landscape. Sales were good with paintings going home with new collectors. The weather was outstanding making me glade I live in Florida. The truck is unpacked and ready to refilled with plein air equipment. Another quick turn around and I am off to the Evinston Plein Air Event. Evinston is just up the road from me so I can paint sun up to sundown and return home to my own bed...which always beats staying in a hotel. The artists in the event are the best plein air painters around and I am fortunate to be included. The landscape is just what I enjoy painting and the weather is predicted to be perfect...what more can you ask for. Come on out...watch us paint, go on hay rides, eat picnic lunches and see the childrens art display. Buy a painting, any painting, and go home with a smile on your face and a memory for your home. "Cypress Sunset" , 3" x 2" is painted on gallery wrapped canvas. 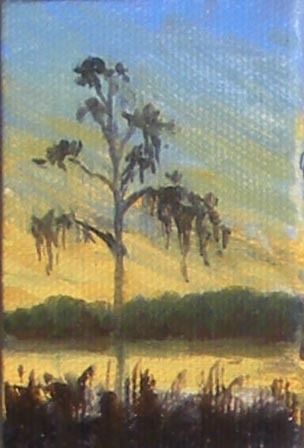 This little painting was inspired by my trip to Wekiva Springs State Park during the paint out event. The sunsets were magnificent over Lake Prevatt and needed to be recorded. I hope to translate these little images into a larger studio painting soon. Congratulations to Celeste for winning last weeks painting. I am having great fun with these little guys. I hope you are too. The Santa Fe Spring Arts Festival is this weekend in the beautiful Historic District of downtown Gainesville between East University Avenue and N.E. 7 Avenue. You can find me in BOOTH #451 just north of 4th Avenue. The weather man has predicted great weather, so I do hope you will get out of the house and come on down. I have a whole collection of new paintings you have not seen. A number of the paintings are from plein air events I have participated in this last year. Mention reading this blog and receive 10% Off your purchase from me during the show. "Golden Sunshine" is painted in oil on gallery wrapped canvas and measures 2"x3". 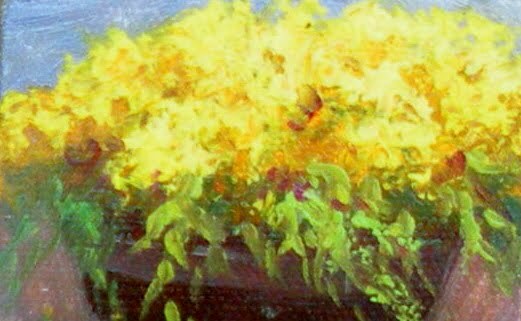 As I painted another, larger scene at Epcot this barrel full of gorgeous, brilliant yellow flowers kept calling to me. I hope you enjoy it as much as I enjoyed painting it. I am a little tardy in getting this posted to the blog so bids are already in with the highest being $35.00. You may bid any amount over that until 5 pm EST, Monday April 12. Receive news flashes about upcoming shows, new paintings, new limited edition giclee prints and other extraordinary things. Just email me (jackie@jackieschindehette.com), put Subscribe in the subject line and you are all set. This is an opt-in service only and you may opt-out at any time. Oil on Canvas 4" x 6"
To place a bid for the Painting Auction just email your bid (jackie@jackieschindehette.com) and put Auction in the Subject line. Be sure to include your bid amount and title of the painting.